U.S. President Donald Trump increased economic pressure on Venezuela's leftist President Nicolas Maduro on Thursday with new sanctions aimed at disrupting the South American country's gold exports. 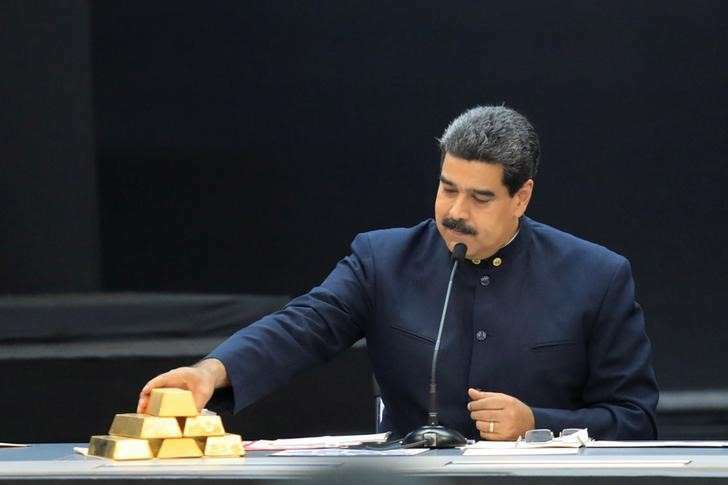 Trump signed an executive order to ban anyone in the United States from dealing with entities and people involved with "corrupt or deceptive" gold sales from Venezuela, Trump's national security adviser John Bolton said in a speech in Miami. "The Maduro regime has used this sector as a bastion to finance illicit activities, to fill its coffers, and to support criminal groups," Bolton said. Bolton made the announcement as part of a pledge to crack down on what he called "the troika of tyranny" in the western hemisphere, naming Cuba, Venezuela and Nicaragua. Bolton's remarks were likely to be well received by those Cuban-Americans and other Hispanics in Florida who favor stronger U.S. pressure on Cuba's Communist government and other leftist governments in Latin America. Bolton spoke at Freedom Tower - a building where Cuban refugees were welcomed in the 1960s following Fidel Castro's revolution - a day after Trump campaigned in Florida for Republican candidates. Bolton said Cuba is aiding Maduro's government in Venezuela, referring to the close ties between the two countries since Maduro's predecessor, Hugo Chavez, came to power in 1999. Trump has taken a harder line on Cuba after Obama sought to set aside decades of hostility between Washington and Havana. He has rolled back parts of Obama's 2014 detente by tightening rules on Americans traveling to the Caribbean island and restricting U.S. companies from doing business there. Bolton said the U.S. State Department would "within days" add more than two dozen entities to a list of Cuban organizations associated with country's military and intelligence services. U.S. persons and companies are banned from doing business with the restricted companies. "We want to look at this question with a fresh set of eyes," Bolton said. Bolton also singled out Nicaragua for criticism over leftist President Daniel Ortega's crackdown on political opponents, saying its government "will feel the full weight of America's robust sanctions regime" with measures coming "in the very near future." Maduro, who denies limiting political freedoms, has said he is the victim of an "economic war" led by the United States. The country's gold revenues remain small compared to the OPEC member’s oil sector, which accounts for over 90 percent of export revenue. Early in his presidency, Trump briefly spoke about a "possible military option" for Venezuela, without providing details. "I don't see that happening in part because I am very firmly of the view that as the sanctions torque up, the pressure will become unbearable," Bolton said.